It took me a few days to recover from the half marathon. My body took a hit with those uphills. I ran the half marathon on Saturday and then ran again on Tuesday the 24th for four miles. I then ran Friday for five miles. They were two difficult runs. I was suppose to do three runs for the week but because of work and recovery, I was not able to run the third one. This past weekend I was suppose to run 15 miles on Sunday. Time flew with other things on the agenda and had to leave my run for Monday. I tried to run it after a meeting I had at the Pasadena Convention Center that ended at 6pm. I started my run on Green Street going west. Immediately my legs felt like they were pounding heavily on the sidewalk. I was also carrying a small backpack with my meeting papers and that was not helping at all. It was a difficult run. My body did not feel loose at all. I also got lost somewhere in the residential areas of South Pasadena. There were a lot of downhills as well that created pains on my right knee. By the time I was about two miles from my house, I was starving, tired, and frustrated. I don’t even know how many miles I accomplished but I was out there for close to two hours. 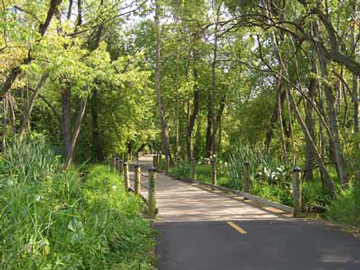 I can’t afford to screw up my long runs! I’m about a month away from the marathon and I need all the energy and training that I can get!!! It was 5:00am on Saturday July 21, 2012 and I was wide awake thinking about the half marathon in two hours. I laid in the comfortable fluffy Hotel Indigo bed in Santa Barbara trying to get myself mentally ready for the Run Montecito-Summerland Marathon. This usually happens to me. I get nervous the last few hours of whatever I’m trying to do. I never think about it days before. It’s always right before the activity happens that I get nervous. I finally got out of bed at about 5:20am and took a shower and got dressed. I wore my black yoga pants because I still haven’t found the running shorts that I’m comfortable with. I wore my new white thick and tight sports bra creamed in vaseline. I put on my new and first marathon shirt that was given to me the night before when I picked up my bib and put on my Asics running shoes with purple shoelaces. I was somewhat ready. I decided to go outside and get my poop loop out of the way. Our hotel was walking distance from the beach. It was the perfect area in Santa Barbara. I ran parallel to the beach for five minutes. It was cold and very foggy but the breeze felt good as I ran. I usually do not like running in the morning, especially this early. But for some reason this five minute felt good. Maybe it was because it was right by the ocean and I love being by the sea. It gave me motivation and encouragement. Sure enough after 5 minutes, I had to go the bathroom. There’s one out of the way. For the people that know me, I know they wouldn’t be surprised on my conversations about poop. I’ve maintained for the most part a high fiber diet for the last 12 years of my life and it has led me to constantly keep an average of four poops per day. Don’t think it’s gross. I like that I’m not keeping wastes in my body. It just happens more when I run. I’ve blogged about it before how I’ve had to create a “poop loop” before I start my run so I don’t have to stop once I start running. So now I run five minutes before I start my official run so I can get the poop out of the way. It always works. So going back to my morning…we left the hotel after 6am and got to Cafe Luna before 6:30am. There was plenty of parking and it was not crowded at all. It was going to be a very intimate run! There was a nice breeze coming from the ocean. I decided to jog again for five minutes and sure enough I had to go to the bathroom again. Once that was out of the way I began to stretch. I felt ok and was trying to keep calm and not get so nervous about the race. 7:00am had now arrived and William and I were lined up towards the front of the starting line. All of sudden the race began and everyone started to run. My heart began to pump fast. I became nervous. Immediately there was an uphill on the next block and I became very anxious and nervous to the point I couldn’t breathe. I didn’t want to stop to walk because I just started but I just felt stressed and uneasy. So I stopped and walked and told myself to breath deeply and calm down. I felt I just needed a minute to get myself together. I took deep breaths and tried to get myself focused by clearing my mind. It worked and I began to run again. I just tried to maintain a steady pace and follow the runners. At this point, William was a few feet behind me. The first few miles were fine once I stopped panicking. We were running parallel to the ocean and there was no sun yet. It was so far a cloudy breezy day. I maintained a good pace for the first three miles and William stayed behind me. Once the third mile began so did the hills. This is when William caught up to me and I started slowing down. I did not want to start walking the uphills. I did not want to get very behind where I was the last one running! I was so worried about that. With only 160 1/2 marathoners, I did not want to be the last one! The hills got worse and I became slower. By the time the fourth mile was there, I was power walking. William had maintained a good pace and he was not ahead of me. The hills were very difficult. My surroundings changed from viewing the ocean to being with the mountains. It was beautiful in Santa Barbara. I was breathing the forrest trees and enjoying the scenery around me. There were still runners around me and I thought maybe if I try to pace myself with others, I would get a little better. There were a few girls around me that seemed to be at my pace so I started running behind them. However I was still going uphill and my running didn’t last that long. I had to stop again to power walk. People were passing me by a lot. There was another girl I tried to follow who was wearing a back pack. That seemed to work a little better. There was also a very old man running the whole time and I don’t think I ever saw hims stop to walk. He maintained his pace the whole time when he was going up hill. I thought that was very impressive and I wanted to be there! So many things were running through my mind through this journey. I no longer saw William in front of me. 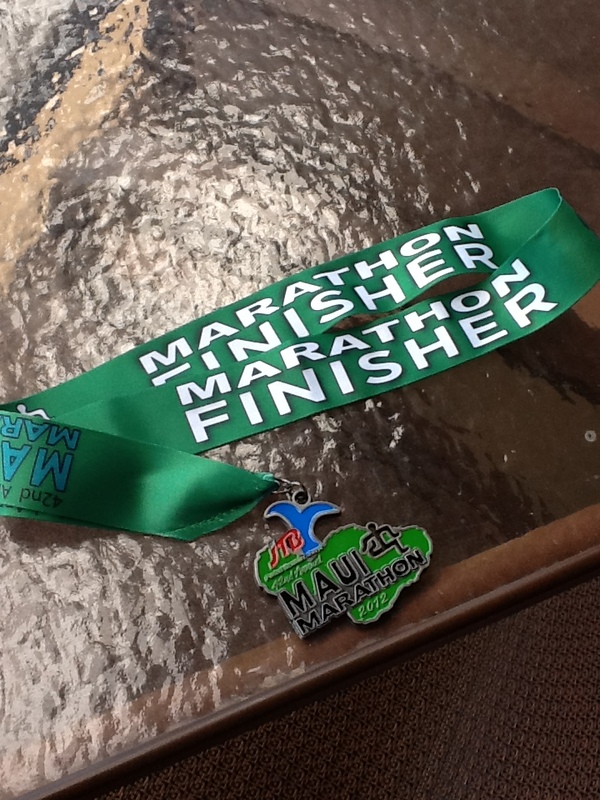 I started thinking about the Maui marathon and thought how in the heck did I commit to this! Running these hills were very difficult and I knew that it was not going to get any easier in Maui. I thought a lot about the marathon during my run. I thought how I always commit to things and then wonder why I do it. I reached the sixth mile and finally the hills started to go down. Yay! My legs felt so wobbly at this point. I was able to run once the hills were over but my body felt numb. I just kept running. I was still around the backpack woman and caught up to the old man running. I passed him up! I tried to maintain a steady pace in the sixth mile. I even got my first cup of water from the volunteers. My hips felt like they were going to collapse. I tried to walk a bit to rest them but that didn’t work. I think my body didn’t want to stop anymore. It was in running mode and if I walked, I felt all the body pains. So I kept running and then I started feeling stomach cramps. It started to feel like there were knots in my stomach and they got very painful! I then walked and took deep breaths to see if it would go away. I was irritated because I was finally running but had to slow down for my stomach cramps. Once I started taking deep breaths, it seemed to calm my stomach down. So there I went again trying to run again. I was wearing my iNano and according to my time at that point, I was not doing so bad on time. During the seventh and eight mile, I knew I was tired but kept running. I tried to think of things that would keep my mind off the running. I started imagining my friends at the finish line rooting for me when I finished even if they were not going to be there but it helped me. I also realized that it was my last day to be 32 years old and I was running a half marathon on my birthday eve! What I was to start my 33rd birthday with already a half marathon accomplished! I thought about William and how much he has motivated me and how together we help each other accomplish certain things in our lives. I thought of how it would be great to live in a place like Montecito. We passed through some grand estates and I hear that one of them was Oprah’s home. I thought of my family and tried to imagine them shouting out my name when I ran through the finish line. I enjoyed this portion of the run because there were hardly any runners around me. Everyone had spread out throughout the course and I just had to make sure I did not take a wrong turn. I think I finally learned during this time of my run what the point of all of this was. I started this race thinking to myself that I did not want to be last. Now I knew what this madness was all about. It was about committing to something and not giving up. It’s about finishing at your best with whatever it is. It was not about the time I was going to do it in, it’s about having the strength to tell yourself that you can do whatever you put your mind to. It’s all in the mind. So somehow I knew that I was going to finish the Maui marathon no matter what. I made it through the ninth mile and my body was still going. I don’t know how but it was very difficult. Maui is going to be huge!!! All of a sudden another hill began at the end of the tenth mile. What the heck!? Another hill? It was not a short one. It seemed like it was one full mile that was going uphill. Why would they do this to us and put an uphill at the end of the marathon?? It wiped any energy I had left to give. I was so frustrated because I had already carried good pace the last few miles and thought I was going to finish in about two hours and 15 minutes. But this last hill blew that away. It felt like the hardest hill ever! And then I hear the old man’s footsteps. The same one that I had already passed was coming back. Oh no! Did it slow me down this much! I was so exhausted. Somehow I got passed that awful hill and there I went downhill. It seemed like this marathon was never going to end! I thought I was near when I saw the ocean again but there were some turns and I was back in the middle of nowhere running all by myself. Just keep going Melissa, just pace yourself is what I was telling myself. The 12th mile was the longest mile so far. I knew I was getting very close when I started seeing the marathoners walking towards me. This means that they had finished and were going home. I asked one of them how close I was to the finish line and she said that I was very close “Just past that turn and you should start seeing the big finish banner” she responded with a smile. I was so close but yet so far away! I wondered if William was there at the finish line waiting for me. I knew I was not the last one because I had again passed the old man and the girl with the backpack. Finally I saw the finish line ahead of me. I looked for William and didn’t see him in the crowd. Where was he? I got closer and heard the people cheering for me. I looked up and I saw William running through the crowds trying to get close to the finish line. I ran and ran and ran until I crossed the finish line! There was a lady there waiting for me to give me my medal. William was there too with a big smile. I took the medal and took William’s hug. It was finally over!!! My official time was 2:28:54.6. I did it in less than two and a half hours! No way! William was very impressed with my time. He thought I would finish in three hours or so. According to him, it was a very difficult half marathon. 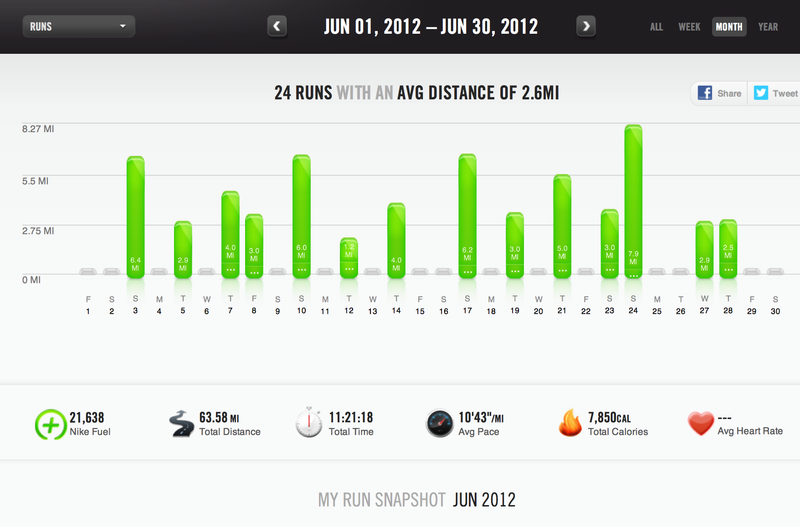 Below is how my pace changed throughout the race. I finished 6th place in my women’s age group from 31-35. Not bad! I was very happy it was over and felt good about it. I can’t believe I’m actually running. I never thought myself as a runner. I was once told my an orthopedic doctor that I’m flat-footed with introverted hips and that I should not try running for exercise. This just shows that sometimes people are lazy! Any of us can do whatever we pleased and I am proud to say that I ran a half marathon! Oh July, how painful you have been! July has been a big challenge for me. My work schedule has been getting in the way of my training. I’ve had to work every weekend in July and when I do that, it’s usually a heavy offsite where I’m working a 14 hour shift on a Saturday on my feet non-stop. This means that I instead of running my long run on Sunday, I run it on Monday and do a lousy job because I’m still recovering from the offsite. This also puts all my other runs during the week behind. William and I also decided in July that we should sign up for a half marathon the weekend where I need to accomplish 14 miles, which happens to be my birthday weekend as well. Why not start my birthday with a half marathon accomplished! It was perfect. This way I got a little experience from an actual marathon and it also made me stay on track for July with my training. 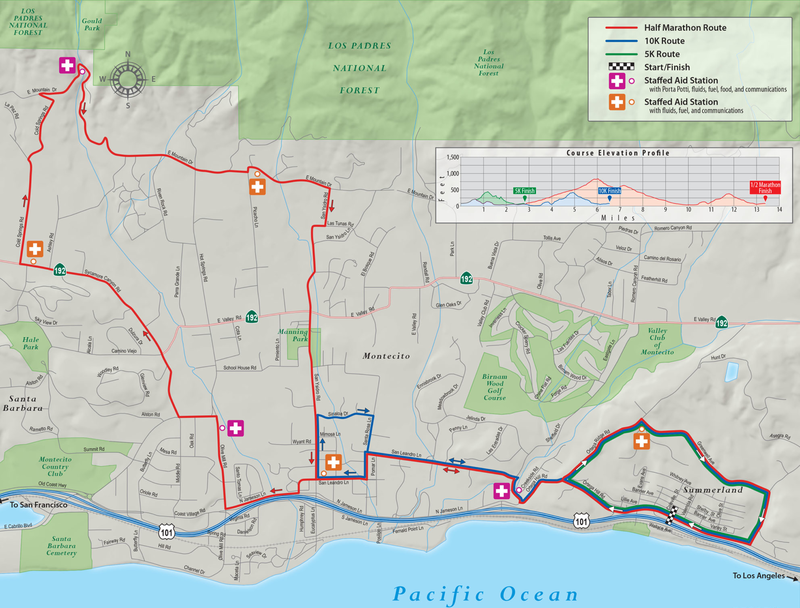 We registered for the Run Montecito-Summerland 1/2 Marathon. 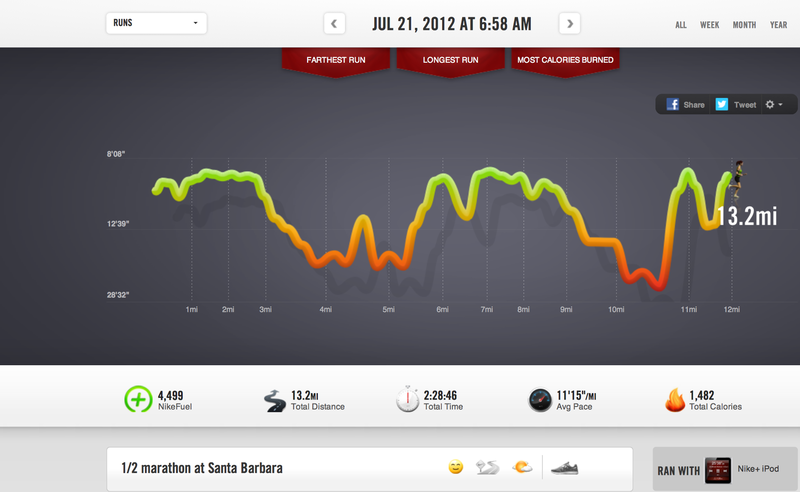 It’s a 1/2 marathon that William found online that would take place on July 21st right up the Santa Barbara area. One day before my birthday. It was a perfect plan. We would drive Friday night, run Saturday morning, wine taste Saturday afternoon, have a lovely dinner by the wineries, go to the beach Sunday morning, and return Sunday evening. We were able to book two nights at Hotel Indigo right on State Street near Stearns Wharf and downtown Santa Barbara. It was a last minute decision that we didn’t really plan early but we were both excited to make this trip happen. We were also trying to get friends to go but last minute plans for everyone else did not work out. Like I said earlier, training this month was very difficult. My 10 mile run that I had to run on a Monday was difficult because I was super tired from a wedding I had worked on Saturday. Since it was a weekday, William decided to run from work to the house to accomplish the 10 miles. I had the day off so I ran from my house and met William at the fifth mile and run the last five miles together towards the house. I remember my legs were tired and I did a lot of walking the last three miles of the run. I was able to finish the 10 miles in two hours and 32 seconds. Not the best time, or at least not the best for me. The following weekend I was supposed to run 12 miles. It was also the weekend before the half marathon. This meant that this 12 mile run was very important to finish. However, I worked both Saturday and Sunday! Saturday I worked for about 12 hours and Sunday I worked about 8 hours. Both dates were me being on my feet. It was awful and I was very tired. William was very good about giving me back and leg massages to release some soreness from my body. I knew skipping the 12 mile run was not an option. But how was I supposed to run it when my legs did not have the energy? Monday came along and I was super tired and still in pain. My lower back was not at its best. William texted me at about 5:20pm to ask me if I was ready for my run. I responded to him that I would start it closer to 6pm. I did not know how I would accomplish this but I got dressed and made myself go out there. I walked the first half mile to get my body warmed up and then started running after the half mile. My back was killing me and my legs were very tired. By the time the mile ended I was walking again. I thought about my options and knew that I did not want to turn back and quit. I also knew that running 12 miles was not going to happen. I thought of how I’ve told myself before that I would try my best at whatever I do and at that instant, my best would be to walk until I met up with William. I tried running a few more times but by the 2.5 mile I was walking again. I walked all the way to Silverlake and got to 4.2 miles and still no sign of William. I did not want to continue walking too much because I should also be recovering and give my legs some kind of rest. I thought maybe I missed William somewhere so I decided to turn back. While I was walking on Fletcher, William came from behind me and found me! I guess he had started to walk on Silverlake thinking I was close by. I turned a little too early. He agreed that it was the right thing to do was to walk miles instead of nothing. Somewhere a long the way, my left calf to my achilles tendon started to hurt really bad. I tried to stretch it out but it wasn’t helping. By the time I got home, I was limping. I was not sure what I did but I figured I would wait a day and find out where this pain was going. On Tuesday, the pain did not go away from the achilles tendon area. I know hurting your achilles tendon can be very delicate and sometimes it can take a long time to recover. This is the last thing I wanted and were just a few days from the 1/2 marathon. Tuesday night I worked a long day. I still had the pain on Wednesday and still limping at work. That Wednesday night, William rubbed my calf and leg. By Thursday morning the pain was gone! It was just a tight muscle that I had and William was able to release some pressure I had there. Thursday evening we had to get another run in between the marathon. Besides my 8 mile walk on Monday, my last run had been on Friday the 13th for 6 miles. It was time to get another one in. We ran only 5.3 miles because we also wanted to save strength for the 1/2 marathon on Saturday. I was feeling confident that I was going to do good in the half marathon. Friday morning we were both very excited. We packed, went to work, and started our drive to Summerland at 5pm. We made it there just in time to pick up our bib and shirt. 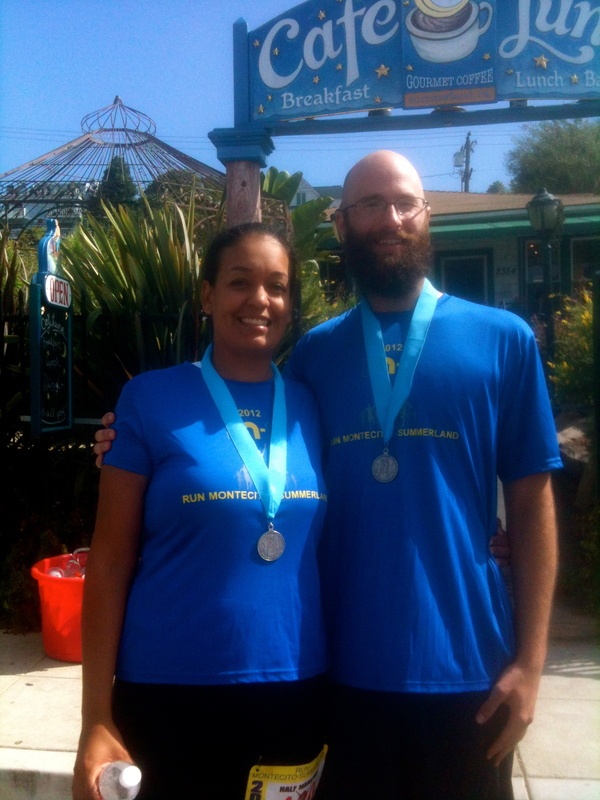 The location where we picked up our bib was Cafe Luna which was also the start and finish line. This is when I started questions. It had just hit me that I did not bother to ask how difficult this course was or how many people were involved. We asked the volunteers there how many people were registered for the 1/2 marathon and they responded that there were only 160 runners. Yikes! This was going to be competitive! I had not realized how small the group was of runners. I finally started to get nervous about the race. What if I would be the last one finished! I did not want that. What if I had to stop and go the bathroom a lot of times? I started having second thoughts about the race and started thinking that I was physically not prepared for this. I had not even accomplished 12 miles yet! My farthest run I had done was 10 miles and the last week I only got in a 5 mile run. I was in panic mode. That Friday night we went to bed early at the hotel so we would have a good night sleep and wake up at about 5am to be at the location by 6am. I also had to wake up early because I had to do a 5 minute run before the marathon so I made sure I went to the restroom. The whole night I couldn’t sleep. My mind never went to sleep. I kept dreaming that I missed the marathon or that I was very behind. Finally the alarm went off and it was official. The half marathon was just two hours away and I was wide awake. Getting injured during training can be very frustrating. After I ate it on June 12th, the training became a little difficult. The next day after my knees were badly bruised, my body was very sore and especially my back. I think it’s because I hit my left side of my body against a wall as I was falling down. I felt like I had been in a car accident. Luckily it was my rest day and I had also made an appointment with my chiropractor. I went to the appointment after work and I described to my chiropractor my fall and she said that I had been whiplashed. I receive a 50 minute massage well needed! At one point I fell asleep and snored a little. It was relaxing. It’s been a long time since I’ve had a massage. The following day on Thursday was my my 4-mile run. I thought I was going to be ok with it but it was very painful on my knees. They were very swollen and it caused me to stop a lot and walk instead. I still managed to finish the run in 42 minutes. On Friday I went to work and my knees hurt the whole day. Friday was supposed to be a 3-mile run. After work I decided to instead take a walk instead of a run. What I did not want to do was to baby my knees too much but I also knew that they needed to heal. At this point my left knee had a huge scab that cause my skin to tighten up. It hurt every time I had to straighten my leg or bend it. I was able to walk to Fresh and Easy which was about a total of two miles. It was the first run I’ve had to skip since I started my 16-week training. I was bummed about it and worried that I was not able to run over the weekend. Fortunately Saturday was a rest day and relaxed the whole day. Sunday the 17th was my first seven mile run! William and I wanted to run it in the morning and not wait around. We had oatmeal in the morning and by the time we got out of the house it was about 10:30am. The day was clear and sunny with a nice California breeze. Immediately when I started the run, I felt very heavy and tired. It wasn’t necessarily my knees that were hurting, it was just very difficult to run. I wasn’t even lasting a mile without stopping! William was way ahead of me and did not seem to be having the same challenges I was having. I didn’t know why it was so difficult. I was so tired. Then it started getting hot and felt that this run was taking forever! The run was towards San Pascual and instead of stopping by the trail, this time we had to run to Arroyo Blvd and stop at Madeline Drive and come back. I didn’t realize that Arroyo Blvd was an uphill. I was in hell! This has been the worst run ever. My body was rejecting every second of my run! William was not being soft on me either. He kept pushing me (which I think helped me finish it) not to stop. On the way back, probably on my fourth mile, I got very emotional and teary-eyed. Too many emotions started running through my head and felt very frustrated and restrained from everything. What a painful run. My knees also began to hurt and felt like they were very swollen. I don’t know how I made it back home but finally did. I didn’t even complete the seven miles. I only accomplished 6.23 miles. I don’t know what went wrong this time. Was it the time of day? I’ve been running only in the evenings after work. This one was my first morning run in a long run. Maybe I didn’t have that much energy in the morning, but I had my oatmeal! Maybe it was the heat getting me tired. I don’t know. I just know that it was awful! I was very disappointed with myself. My fourth week of training started on Tuesday the 19th. My knees were still bothering but I felt I did not feel I had room to slow down, especially about going through that dreadful run on Sunday. It was only 3 miles on Tuesday and knees did begin to hurt by the end of the run. It was very had to run downhill. My knees were getting pounded on the downhills and I don’t think it was helping the healing. Wednesday was rest day and Thursday was five miles that I did a lot better. I still had to stop to rest my knees from the pain but did manage to finish 5 miles. 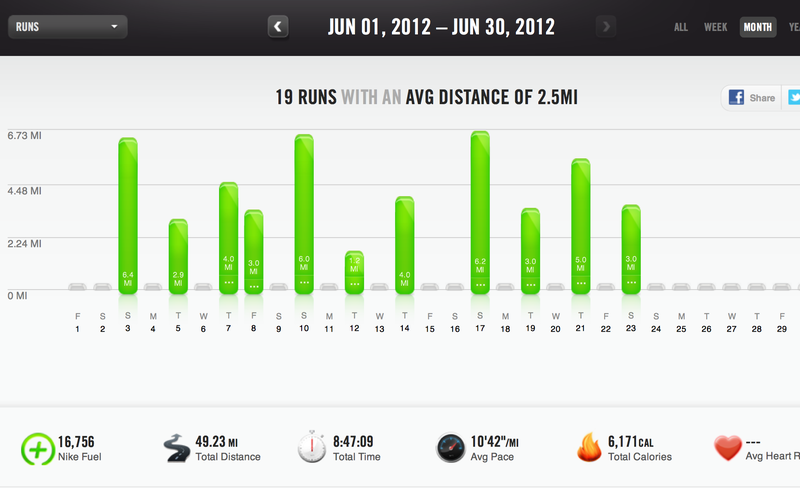 My running has been looking good now! Tomorrow will be my first 8 mile run. I’m a little nervous and I need to make sure that it’s nothing like last Sunday. I hope I do better!